Get to Grainau via Munich (perfectly connected to the German ICE network) and Garmisch-Partenkirchen (regional train). In Garmisch-Partenkirchen take the cog railroad to get to the 'Zugspitzbahnhof' in Grainau. From here it's just 3 minutes to walk to the initial point of the tour. Via Munich: take the motorway A 95 (heading to Starnberg / Garmisch-Partenkirchen); at the end of the motorway in Garmisch-Partenkirchen follow the federal highways B 2 and B 23 to Grainau. Alternatively take the motorway A 7 (Ulm-Kempten) and get to Grainau via Reutte and Ehrwald (Austria). From the Munich airport take an urban railway to Munich main station and go ahead to Grainau via Garmisch-Partenkirchen from there. From the Innsbruck airport get to Grainau via Innsbruck main station and Garmisch-Partenkirchen. The 'Höllentalklamm' Grainau is a must in any case while being on vacation in the Zugspitze region. A hike through the gorge is an unforgettable experience for young and old people. From the 'Dorfplatz' in Obergrainau (in the center of the village) a foot path leads to the Höllental-Eingangshütte through a valley becoming more and more narrow. The path is approx. 4 km long, and the hiker will gain 300 meters in altitude. The Höllentalklamm is accessible by foot only! On a length of approx. 1 km the Höllentalklamm presents an amazing look into the natural forces and offers a unique and bizarre landscape. Canyons up to 150 meters deep, countless cascades, huge chunks of rock and ice and labyrinthine, narrow paths, tunnels and little bridges bring a very special optical experience – really a feast for the eyes. After approx. 45 minutes one reaches the end of the flume on an altitude of 1,193 meters. In the Höllentalklamm, cool temperatures are also on a high summer day. Pay attention therefore on appropriate clothing and most importantly: sturdy shoes! It's worth it to continue the hike up to the Höllentalangerhütte, located in a bottom of a valley with little vegetation and covered with broken stones. At the upper end of the flume the compound becomes more spacious again. At the Höllentalangerhütte the path divides into several ascents to the Zugspitze, the Osterfelderkopf, the Alpspitze and other ambitious destinations in the Wetterstein mountains, such as Riffelschafte, Riffeltorkopf, Riffelspitzen, Hohe Riffel, Waxenstein, Höllentorkopf and Schwarzenkopf). These tracks are recommended for experienced hikers resp. mountain climbers with appropriate equipment only! The Höllentalangerhütte offers various meals and drinks, and after an extensive refreshment it's time to return back to Grainau. Linderhof Castle in the upper bavarian village Ettal in southern Bavaria is a castle which was owned by King Ludwig II. Linderhof was the favorite castle of the „Fairy Tale King“, and the majority of his visits to his castles was this one. Ettal is just 20 km away from Grainau (25 minutes to go by car). The Partachklamm (702 meters long) can be found in direct neighborhood to the Höllentalklamm. The canyon can be walked over the entire year. There’s an entrance fee (between 2 and 3,50 Euros - status: 2014). More than 200,000 people visit the Partachklamm every year. The Partachklamm is quite wet, even if it didn't rain for a longer period, hence it's recommended to wear sturdy shoes as well as rain gear. Canyoning – the bavarian mountains between Garmisch-Partenkirchen and Reutte (Tyrol) are full of fascinating canyons. Equipped as a mountain climber and coated in warm wetsuits the visitors are perfectly protected against any balk. Follow the water inside the canyon by jumping, sliding, swimming, and roping. Certified mountain guides care for maximum safety. This guest house is a beautiful Alpine-style building in the scenic village of Grainau, at the foot of the Zugspitze Mountain. Gästehaus Marianne offers a spa area with a sauna and massages. 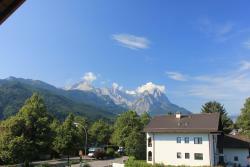 This stylish apartment is situated in the mountain resort town of Garmisch-Partenkirchen. 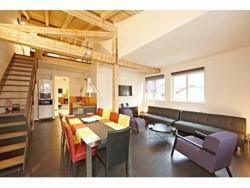 Luxus-Apartment im Bayerischen Skigebiet features free WiFi throughout and a large balcony offering views of the mountains. Just 5 metres from the pedestrian zone in Garmisch-Partenkirchen town centre, these designer apartments offer free Wi-Fi, free parking, and kitchens with dishwashers. The apartment building features 2 restaurants.